3. etasje leilighet med panoramautsikt over sjøen. Utsikt over basseng og strand. Denne sentralt beliggende leiligheten er romslig (87sq meter totalt) med hovedoppholdsareal til balkong som gir full utsikt over stort basseng og anlagt rekreasjonsområde og også uhindret utsikt over bukten og marinaen til Nessabar og Sunny Beach. Leiligheten er flislagt gjennom, har klimaanlegg i hovedboare og begge soverom, to bad hver med egen kjele og dusj, en indre hall, stue med åpen kjøkkenløsning og balkong som fører fra den. Hvert av soverommene fører også til separate balkonger. Stuen og hoved soverom balkonger har utsikt over bassenget og havet og vender ut mot solen - flott for å overvåke bassengaktivitet og få en brunfarge samtidig. To store balkonger med utsikt over havet (som er bokstavelig talt et steinkast unna) og nybygd marina hvor du finner mange restauranter og butikker. Det er mange bussutflukter, båtturer, turgåing, ridning, vannsport på tilbud og bilutleie er tilgjengelig fra flere lokale turisttjenestesentre. Disse inkluderer for eksempel en 2 dagers buss tur til Istanbul, en tur til Sofia og The Rila Monastry, The Blue Mountain og Zheravna, Sozopol og et elv cruise på Ropotamo elven eller Varna og dens Dolphinarium. En bulgarsk landsbytemautflukt som tar deg gjennom noen typiske landsbyer i nærheten av St Vlas, og vil gjøre deg kjent med den unike bulgarske folkloren. Fortryllende program av danser og sanger. By far the worst property and experience we've had using VRBO! This property was badly misrepresented by the owner who would also prove to be completely unresponsive and unaccountable throughout our brief stay. We were originally scheduled to stay for about a month, but left after just 4 days. Virtually none of the amenities advertised were open. For example, the pools, gym, hair salon, onsite restaurants, 24 hour security and onsite rental office were all closed for the season! This was never disclosed in the listing or in any communication with the owner prior to our arrival. The owner told us that we would be able to pick up the apartment keys at security when we arrived. Because security and the rental office was closed, we had to roam around after midnight to try and find someone who could eventually help us gain access to the apartment. Once we finally got in, we discovered a dirty apartment, disgusting furniture, a broken hot water heater and no cable TV or WIFI. There were no paper or cleaning products for us to even clean the apartment ourselves. When we were finally able to contact the owner after more than 24 hours, he did absolutely nothing to fix our problems. Moreover, he didn't even offer an apology for any of the issues! He wouldn't return our phone calls. He only sent emails 24 hours after we tried to reach him and stopped responding altogether when I requested a refund. I would highly recommend staying away from this property and this owner. BTW, he would not process a refund for our scheduled stay so we had to contact VRBO to resolve the issue through their policy against property misrepresentation. This was an extremely disappointing and stressful stay as we had to scramble to find a suitable last minute replacement property. We have had so many great experiences using VRBO so this was quite a surprise to us and one we hope others will avoid. Unfortunately, main issue encountered was the holiday period for the guest fell out of season and facilities normally open in the resort and surrounding area are closed down during this time at the resort in preparation for winter. I would encourage guests travelling long distances to become familiar with the holiday season in Bulgaria to ensure expectations will be met; and also to raise questions as appropriate when making enquiries. As owners, we have no way of knowing whether you are looking for peace and quiet or something else. Also, to further assist guests in future, the advert has been updated to reflect the holiday season runs from mid May to mid September. the apartment is spacious and comfortable; stunning view; It has all the necessary facilities for a successful holiday; the owner responds promptly to any requests; the complex also has several swimming pools - free access, small restaurants, shops and bars / pubs; fine sand beach (blue flag) and clear water; quiet area suitable also for families with children. 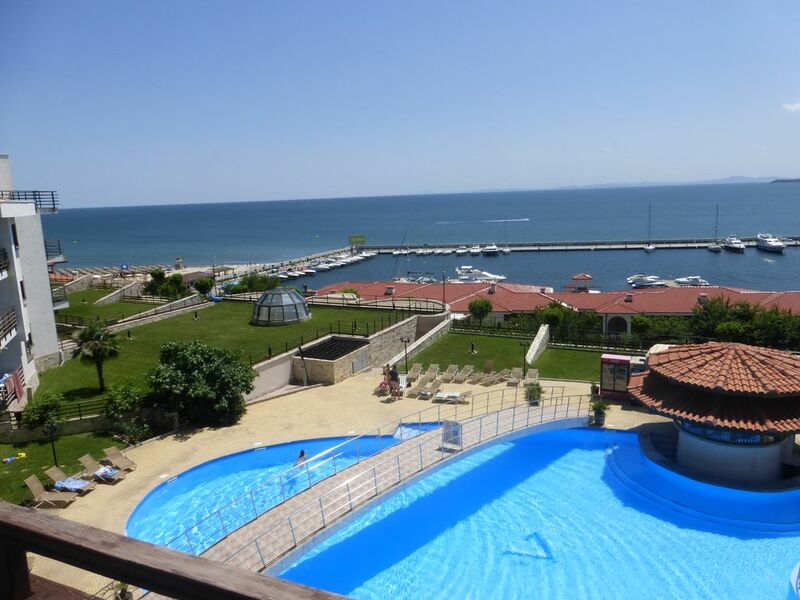 the property is 15 km away from the largest aqua park in Bulgaria. We will return next year. "Apartment is one of the best I''ve ever rented, nice and functional (fully equipped kitchen- cutlery, plates,-AC, etc.). Flat position is excellent. Is more beautiful than shown on the site. The owner has been prompt and very seriously, and provided all necessary instructions. Area is suitable for children, very clean beach sand, and very nice childrens pool. We found playgrounds, several small shops and several restaurants, an outdoor theater and a nice Orthodox church painted in the resort. Wait to return next year." "Pas mal de poussiere en arrivant, très belle vue; très agréable le soir. Appartement très confortable, bien équipé et facile d'accès." First of all thanks to the owner for the very helpful and engaged attitude! Everything, also the pick up service from and to the airport, was reliable and just in time. We never had a better view to the sea like in this appartement!The app. was very spacious and clean. Every room was air - conditioned, for that we were very thankful, because it was very hot in the summer. The TV has had a lot of programms. So the kids were happy, to watch their favourites also in the german language. Not only the appartement was clean but also the whole compex and the pool area. The sun chairs were free at the pool, the sunshade did cost circa 1Euro/ day. At the beach you had to pay ca. 3,50 Euros/ day for 2 sunchairs and 1 sunshade. The beach also was very cultivated. There are a lot of nice restaurants in the near of the appartement and a nice wellness center. German people we did not notice in this complex, the most people came from England and Russia. Our kids came in contact with some english kids, so that their experience in the english language did make progresses! If you like to clean your towels, it is better to bring them by yourself to the laundry in Sveti Vlas! Don´t use the service from the manager of Diamante, because the prices are absurd exsessive!!! There is only one negative point in the appartement: the bed sofa is not very comfortable and has not a high mechanical load capacity, but for 2 weeks and 1 kid it is okay. We wish all the guests in the future lazy and relaxing days like we had! "Very seriously. Everything was like in the description. Beautiful apartament, good position (near the sea) in a wonderful resort. Hopefully we will return here as soon as possible"